Good Leaders Gone Bad: Slavery or Freedom? Leadership invariably creates expectations for others. Whether by example, direction, or command, followers are invited, if not required, to respond to the leader’s vision. As Max De Pree has said, the first task of the leader is to define reality. Without exception, that reality is meant to implicate the follower and evoke an appropriate response. In my experience, good leaders have high expectations. That’s true not only in entrepreneurial settings or established for-profit businesses, but also in thriving non-profits and churches. Still, a high commitment leadership culture can come at a price. In the technology industry, for example, there are multitudes of stories about unrealistic product schedules that devastate development teams and their families. Even more sadly, some organizations seem to revel in creating such a culture as a business virtue, despite its long-term toll. So what underlies the turn from good leadership to bad in the area of high expectations? Where do we cross over from legitimately expecting much of ourselves and others to placing “heavy, cumbersome loads” on them? I find today’s text describing Jesus’s interchange with the Pharisees instructive. In his day, the Pharisees certainly fit the profile of being “high expectation” religious leaders. Nevertheless, Jesus takes them to task for the way they led God’s people. Jesus begins his critique by using language that would surely remind his hearers of the great Exodus story. Despite their commitment to the Law of Moses, Jesus says that the Pharisees “tie up heavy, cumbersome loads and put them on other people’s shoulders.” The imagery Jesus uses inescapably alludes to Israel’s enslavement by Pharaoh in Egypt. Particularly interesting is Matthew’s word for “tie up,” which is used elsewhere in the New Testament to describe people being imprisoned (see, for example, Acts 22:4). We are left with a devastating assessment of the leadership of the well-intentioned Pharisees: they have become like Pharaoh of Egypt, enslaving and imprisoning those who follow them, instead of being agents of God’s redemptive work to set his people free. Do our high expectations as leaders set people free or enslave them? That seems to me the crucial question in Jesus’s critique. How might our work as leaders empower those who follow us to fulfill their potential and use their unique gifts? Are we more concerned with end results than with those who follow us? How do we create space for our followers to develop their own leadership gifts? These are difficult questions that must be worked out in the crucible of real-life work situations. As with many of you, I know how difficult and messy this kind of leadership can be. Finally, Jesus ends today’s text by pointedly saying that the Pharisees lay these heavy burdens on others and “are not willing to lift a finger to move them.” High expectations can easily become focused on others rather than ourselves. In a demanding, fast-paced environment, we can digress to directing others what to do without actually entering into the work ourselves. The more senior our role, the more at risk we are of this. I admire leaders who regularly step into the front lines of their organizations to understand the work that they ask others to do. There are two foundational biblical words that capture positively what Jesus implies in today’s text for good leaders. Jesus expects leaders to provide hope and help. Hope is fundamentally about the transformation of work that enslaves to work that sets people free. Help reminds followers that leaders are there not just to pile on responsibilities, but to serve alongside their followers in their work. None of us do this perfectly. At best, in our fallen and yet redeemed state, we exhibit glimpses of what Jesus has in mind. Perhaps that’s a reminder that our leadership is ultimately but a signpost to God’s rule. As the Psalmist writes, “Blessed are those whose help is the God of Jacob, whose hope is in the LORD their God.” (Psalm 146:5) That should both encourage us as leaders and inspire us to live more faithfully in response. Lord Jesus Christ, you who are our help and hope, we ask that you help us to serve as leaders who allow those who follow us to flourish in their gifts and vocations. Help us to wisely discern people’s capabilities and competencies, to nurture their capacities to creatively serve and lead in their spheres of responsibilities, and to direct and coordinate the work of the community of followers you’ve entrusted to us. Forgive us when we enslave rather than empower those who follow us. Forgive us when we unnecessarily add to their burden rather than work to lighten their load. Help us to be your agents of help and hope. We ask in your name, Amen. 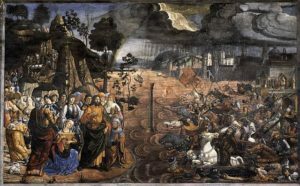 Image Credit: The Crossing of the Red Sea by Cosimo Rosselli, Public Domain. Today’s devotion was so good on so many levels – thank you very much!